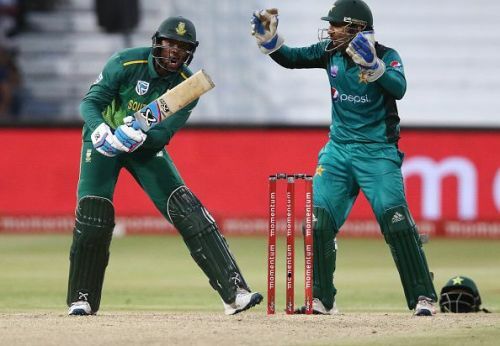 Pakistan captain Sarfraz Ahmed might have landed himself in serious trouble for making racist comments on the field against South Africa all-rounder Andile Phehlukwayo during the second ODI at Durban on Tuesday. During South Africa's run-chase, Sarfraz was caught on the stump-mic making a racist taunt to Phehlukwayo. The wicket-keeper batsman told in chaste Urdu: "Abey kaale, teri ammi aaj kahaan baitheen hain? Kya parwa ke aaye hai aaj?". Sarfraz's comments can be loosely translated as, "Hey black (guy), where is your mother sitting today? What [prayer] have you asked her to say for you today? After losing the first ODI at Port Elizabeth, South Africa bounced back with a comprehensive five-wicket victory in the second ODI at Durban. Upon winning the toss and opting to bowl first, the Proteas bundled out Pakistan for 203. Phehlukwayo was the pick of the bowlers. Operating with guile and mixing his pace, the right-arm seamer picked four wickets at the cost of just 22 runs. One of his victims was Sarfraz himself. The Pakistan skipper's defence was breached at a crucial point in the innings. Chasing 204, South Africa collapsed to 80/5 as Shaheen Shah Afridi and Shadab Khan picked wickets in clusters. Coming into a crisis situation, Phehlukwayo showed immense resolve and stitched together an unbeaten match-winning partnership with Rassie van der Dussen. With Sarfraz himself leading the charge, Pakistan's close-in fielders tried to unsettle Phehlukwayo by launching a relentless verbal barrage. During the 37th over of South Africa's run-chase, Phehlukwayo took a single off Shaheen Afridi by virtue of an inside-edge. The left-hander was going strong at 50 at that point in time. As he reached the non-striker's end, Sarfraz's frustration boiled over and the racist comment ensued. On air, Mike Haysman tried to enquire to Rameez Raja regarding the meaning of Sarfraz's taunt. However, the former Pakistan captain-turned-commentator responded by saying, "Difficult really to translate that. It's a big long sentence." Obviously unable to understand the nature of Sarfraz's comments, Phehlukwayo carried on undeterred and remained unbeaten on 69 to take South Africa to a series-levelling victory. He was named Player of the Match for his all-round efforts. At the post-match presentation, Sarfraz referred to Phehlukwayo as the one with the 'difficult name' and admitted to having issues pronouncing the all-rounder's name. It is up to the match officials to determine whether those comments demand disciplinary action against the Pakistan skipper. It remains to be seen how the match referee and umpires deal with the situation. Under ICC's Anti-Racism Code, any such offence is described as "any conduct (whether through the use of language, gestures or otherwise) which is likely to offend, insult, humiliate, intimidate, threaten, disparage or vilify any reasonable person in the position of a Player, Player Support Personnel, Umpire, Match Referee, Umpire Support Personnel or any other person (including a spectator) on the basis of their race, religion, culture, colour, descent, national or ethnic origin." The third ODI between Pakistan and South Africa is set to take place at Centurion on Friday.